My last blog (See “Producers, strapped for cash? What are your Options?“) looked at a trading strategy for producers to manage cash flow associated with a low absolute price of oil, i.e. to hedge the height of the forward oil curve, A. See Chart 1.This blog will look at a strategy for producers to hedge the slope of the forward oil curve, T.
The earlier blog, referred to above, discussed the possibility of producers raising cash by selling options when oil prices are low. 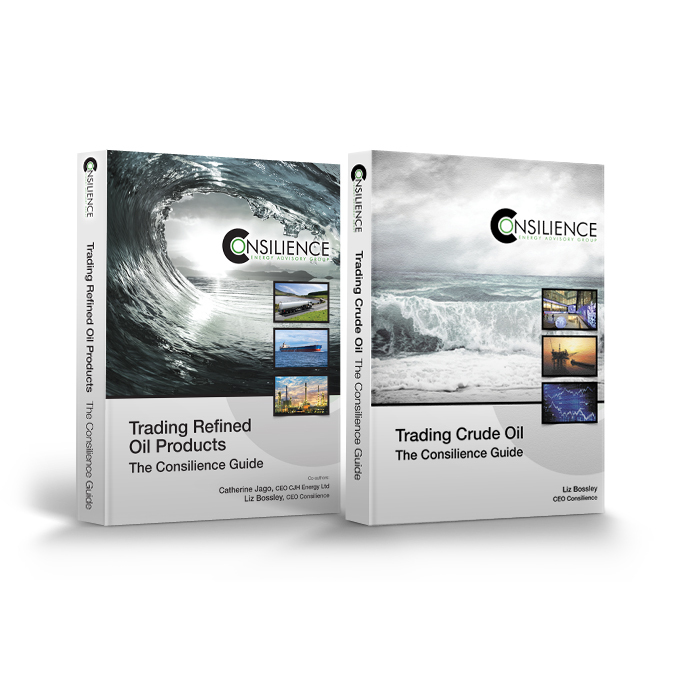 This blog addresses the issue that, when oil prices are low and producers are hesitant about locking in low levels, the slope of the forward curve is typically in an attractive contango formation, i.e. forward prices are higher than current prompt prices. 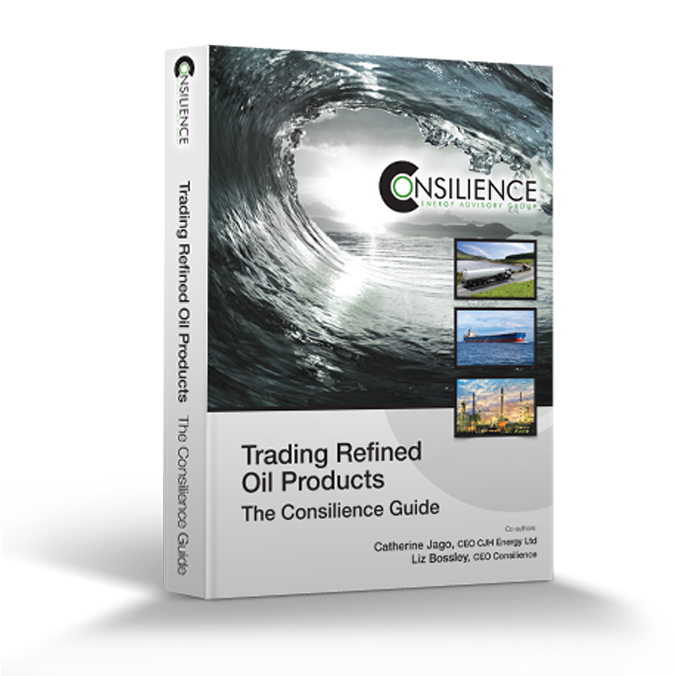 Producers like contango because it allows them to sell forward contracts at prices that are higher than the prompt prices that they, and their shareholders, see reported in the press. But high prices typically mean that the forward oil curve is in backwardation, i.e. forward prices are lower than the prompt prices that make the producers want to hedge in the first place. Chart 2 provides an example of high prices with the market in backwardation. What constitutes a “high” price or a “low” price is entirely subjective. For some producers the fact that they can simply sell forward oil for delivery after the second half of 2016 at $45+/bbl may sound like a good hedge of some particular project. In which case all the hedger needs to do is sell forward oil for delivery in 2H2016. 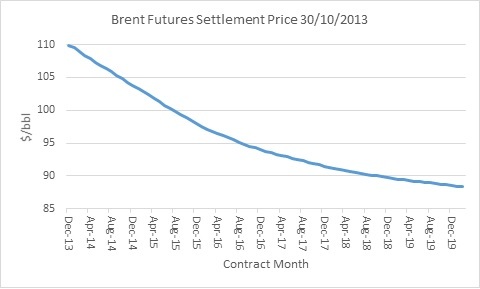 In an ideal world producers want a contango forward oil price curve in a high oil price environment, i.e. the value of the absolute price, A is high and the value of the slope of the forward curve, T, is low, less than $0/bbl. This can and does occur naturally, often just before prices crash because there is too much prompt oil around. 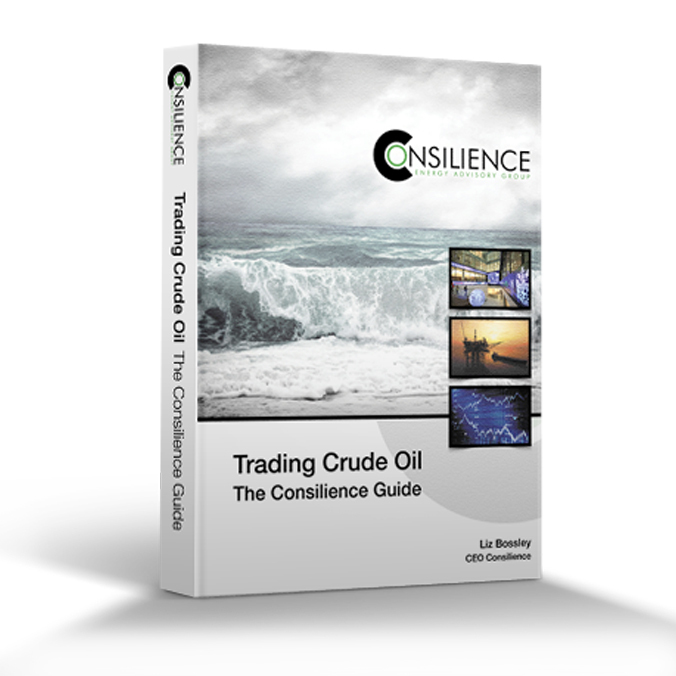 Buy the slope of the forward oil curve, T, while it is in contango, i.e. <$0/bbl. When prompt prices reach the level at which the producer wants to hedge, sell the absolute price of the forward oil curve, A. If all goes well for this two-step strategy and prices recover, the producer should generate a profit as the slope of the curve moves from contango to backwardation, i.e. the value rises from <0 to >0. Then when it deems prices to be high enough to support its project or budget, it sells absolute price hedges. It will have the “slope” profit to add to the absolute price hedge to effectively achieve a hedge at a high price in a contango market. The secret of this strategy is to get the timing right. Not only the time at which the traders execute the hedges, which is always a bit of a lottery given the unpredictable nature of prices, but the timing of the closing of positions to coincide with the time that the physical production being hedged is priced under the producer’s physical sales contract. For example, say the producer has a physical sales contract that sets the price at the average of the published Dated Brent prices over each month of 2017. The producer will not know the price at which it sells its physical oil until the end of each delivery month in 2017. What price level an individual company finds acceptable -$40? $50? $60? – will depend on its price assumption for planning purposes and/or the cost structure of the asset it is hedging. It may wish to ensure that it sells its oil in 2017 at, say, not less than $60/bbl, so hopes to hedge its oil for delivery in 2017 at ≮$60/bbl and it wants to do this before the end of the year, i.e. before end December 2016. A price of $60/bbl is not currently achievable for oil to be delivered in 2017 because the market is about $15+/bbl below that level. But there is about $3.50/bbl of contango between the price of oil for delivery in the second half of 2016 and oil for delivery in 2017. In other words the slope of the curve between July-December 2016 and 2017 is roughly minus $3.50/bbl. The producer cannot hedge the absolute price, A, at a satisfactory level, but it can hedge the slope of the curve, T, at -$3.50/bbl, which it may find acceptable. To make the numbers easy let’s say the producer’s physical contract is to sell 100,000 bbls of oil in each month of 2017, i.e. 1,200,000 bbls in total. So today the producer would, in trader parlance, buy 1,200,000 bbls of the 2H2016/2017 spread at -$3.50/bbl from an OTC swap provider. It would cash settle the spread by effectively selling 200,000 bbls of the 2H2016/2017 spread in each of the months of July-December 2016. If the absolute level of the price curve increases before the year end, then there is a good chance that the slope of the curve will move from from contango to backwardation. There is no law that dictates that there will always be backwardation when absolute prices are high and contango when they are low, but over time I have observed this frequently to be the case. For illustrative purposes, let’s say the actual average 2H2016/2017 spread over the six months of July-December 2016 eventually works out at $0.25/bbl of backwardation. The producer cash settles the spread swap by selling it back to the swap provider at +$0.25/bbl. The producer makes $3.75/bbl on the 2H2016/2017 spread (sells at $0.25, buys at -$3.50=$3.75/bbl). If the front end of the forward curve has moved up to, say $60/bbl, the producer will want to hedge the absolute price to fulfil the original objective of ensuring that it sells its oil in 2017 at not less than $60/bbl. But if the prompt price of oil for delivery in January 2017 has shot up to $60/bbl, then chances are the market will have moved into backwardation, so a $60/bbl hedge absolute average sales price for the whole of 2017 may not be achievable. For example, there may now be $2-3/bbl of backwardation between oil for delivery in January 2017 and oil for delivery in December 2017. The average swap price for oil for delivery in all the 12 months of 2017 at which the producer can sell its absolute price hedge may be only, say, $57/bbl. So the producer cannot fulfil its board mandate to hedge before the end of 2016 its physical sales contract volume for delivery in 2017 at ≮$60/bbl, even though the board members may be seeing an oil price of $60/bbl in its FT or WSJ. But the producer has a $3.75/bbl spread swap profit in hand, so it can achieve an effective 2017 hedge price of $60.75/bbl, i.e. $57+3.75/bbl. The two step hedge has got the producer where it wanted to be. The big risk is that absolute prices do not recover and the slope of the curve does not move from contango to backwardation. In which case the producer will either breakeven or make a loss on its slope of the curve hedge swap and will never get the opportunity to place its absolute price hedge. This is a real risk of a financial loss and there is no offsetting gain on the physical sales contract, which is what you would expect to see when hedging. A loss on a slope hedge taken in isolation could be easily misconstrued as a speculative punt that went wrong. So any producers planning a two-step hedge of this nature had better have a well-informed management and shareholders on-board with the strategy before they set out. Whether this activity would qualify for hedge accounting treatment or would be recognised as a hedge within the meaning of EMIR regulation [click here for an explanation of EMIR] is difficult to say, but I expect that buying a spread swap that loses money could be challenged as a speculative adventure, particularly if the deal made a financial loss. The producer would be losing on both sides of an apparent hedge. Hedging the slope of the curve may be easier to justify by having the producer buy a call option on the spread swap rather than buying the spread swap itself. Such options exist and are traded in the OTC market. So a producer could buy an option to buy the 2H2016/2017 spread swap at a strike spread of, say, -$3/bbl. Does that mean that a producer with a mandate to hedge, but not to speculate, should not enter into outright spread swaps, but should only buy spread options? Perhaps. No market activity should ever be undertaken without an analysis of the company’s risk profile, risk appetite and market price view. If a trader is in doubt about whether a particular deal is permissible under its mandate, chances are what they are about to do was never considered by the board when it issued delegated authorities. It is never a good policy to take the board or shareholders by surprise. A bit of spadework explaining the strategy upfront can avoid a lot of grief later on, including the necessity of hiring me, or someone like me, as an expert witness in a court case. Knowing what the company wants to achieve with its hedges is considerably more than half the battle in tailoring an appropriate and successful hedging package. The rest is just mechanics. But it is in the mechanics that companies often trip up, usually by under-estimating the deep pockets needed to meet margin calls or by failing to get buy-in by stakeholders to the strategy in advance. Small producers who are wary of getting involved directly in the market and worry about the chairman having to report “hedge losses” to shareholders have a much simpler route to market: build a range of pricing mechanisms into the physical sales contracts themselves. 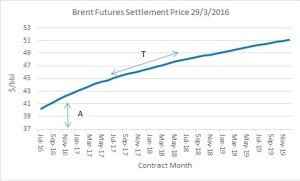 When selling to major oil companies or to the large trading houses it is a simple matter to build all the optionality that a producer wants into the physical contract price clause, without going near the futures or OTC markets. A plain vanilla sales contract based on, say monthly average published benchmark prices, can very easily be modified to give the seller an option to over-ride the default monthly average price and lock in all or part of the price at a time of the seller’s choosing. This is known as “trigger pricing” and is pretty old hat in oil sales contracts. But if the producer wants to get fancier and have the option to lock in the absolute price, A, in the sales contract at, say, $40/bbl even if the market price falls below this level, this can be written into the physical contract. Similarly, if the producer wants the option to lock in contango, T, this too can be achieved in the physical sales contract. 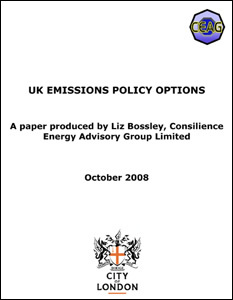 If the producer knows what it wants it is a simple matter for certain categories of buyer to provide it: whatever the price clause says, either plain vanilla or choc-full of options, the buyer will in all likelihood be hedging it anyway, and it matters very little which price formula it is hedging. It should be clear that writing optionality into a physical sales contract is not a free lunch. Trigger pricing is typically provided for free, but including puts and calls in the physical contract price structure will involve the same cost as if the options were being purchased separately in the OTC market. The benefit is that it can isolate the producer from messy market mechanics and margining issues and it side-steps some of the accounting and reporting issues with which small producers are typically ill-equipped to deal. It may even avoid the necessity of entering into a weighty International Swaps and Derivatives Authority (ISDA) contract. From a management perspective it means that, while the company may have an opportunity cost if it structures its physical oil price clause unwisely, it will not have a separate, reportable financial outflow from hedging. Whether that is a good thing or a bad thing depends on the company and the quality of the information it provides to its shareholders. The pitfall to avoid is whether a complex price clause in a physical contract will be recognised by the taxation authorities or the National Oil Company dealing with the producer’s exploration and development cost recovery and profit sharing. But that will be the subject of another blog.